As I've made clear on this site before, I love knitting for babies. Here's one aspect of it that I don't think I've talked about yet: the Baby-Knitting Boomerang. Here's how it works: you knit something for a baby, and you present it to the baby's parents. Baby gets a handknit, parents are touched that you put the time and energy into their progeny, and you get the gratitude and warm-fuzzies of having done something nice. Everybody's happy. Every once in a while you also get a delayed reward. 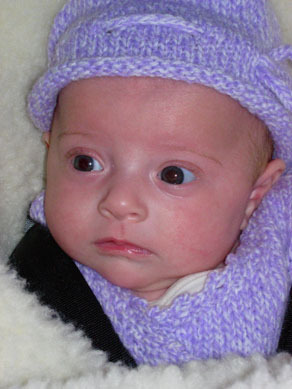 It's a picture of an adorable baby in a sweater that you made arriving by e-mail. Better still, it's arriving at baby's house to find her dressed in duds you knit months ago. Such were the two Baby-Knitting Boomerangs that came back to me last week. I love to get pictures of babies in handknits, but I know it doesn't always work out. Having a new baby around is hard work, after all, whether it's the total life change of the first baby or the exponential increase in demands that comes with any thereafter. So every time I do get a picture, it's a guaranteed Day Improver. In the midst of a grindingly-boring project at work and a sense that this wedding planning is just NEVER GOING TO END, I got a much-needed Day Improver last week. Hey, are you lookin' at my hair? Is that the greatest baby hair of all time, or what? 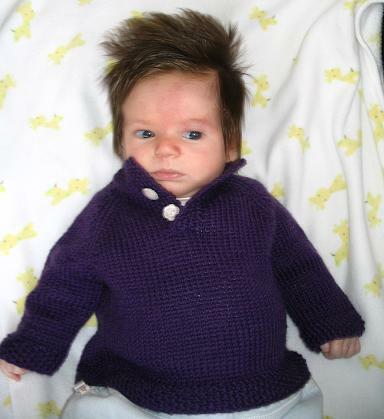 That's one of our most recent baby friends, modeling the (in)famous Purple Placket Sweater. It's enough to make a girl forget about pattern errors. Remember the teeny-tiny Christmas baby who required an emergency sweater? It's amazing what 10 weeks will do. Last weekend, Jason and I were in New York for his dad's birthday celebration. Every year, they have a "guys lunch" at Peter Luger's, and two years ago we started a complementary "girls lunch". I arrived at Jason's sister's home to find Syd decked out in her Wrap Sweater and booties. When she went for a walk later, they even had the hat at the ready. Who's cuter than me? Nobody, that's who. May many Knitting Boomerangs come winging your way! I've never seen such a little baby with SO MUCH HAIR!! Adorable, as are your boomerangs. Glad they made your day. Thank you for the Knitting Boomerangs! I loved the pictures and the knitting was good work. Very sweet! Love that hair! Isn't it great to see the things you've knitted being worn so well? Sydney's blocks are the best though. The lavender sweater/hat/booties are absolutely ADORABLE (so is the baby)! What yarn and pattern did you use (pls advise - I'd love to make this for a friend's baby)?